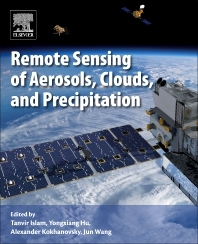 Remote Sensing of Aerosols, Clouds, and Precipitation compiles recent advances in aerosol, cloud, and precipitation remote sensing from new satellite observations. The book examines a wide range of measurements from microwave (both active and passive), visible, and infrared portions of the spectrum. Contributors are experts conducting state-of-the-art research in atmospheric remote sensing using space, airborne, and ground-based datasets, focusing on supporting earth observation satellite missions for aerosol, cloud, and precipitation studies. A handy reference for scientists working in remote sensing, earth science, electromagnetics, climate physics, and space engineering. Valuable for operational forecasters, meteorologists, geospatial experts, modelers, and policymakers alike. Dr. Tanvir Islam is presently with the NASA Jet Propulsion Laboratory, and specializes in remote sensing observations. Currently, he is engaged with the development of advanced microwave calibration and retrieval algorithms for NASA’s Earth observing missions. Prior to joining NASA/JPL in 2015, he was with the NOAA/NESDIS/STAR, and worked on the development of satellite remote sensing algorithms, with an emphasis on microwave variational inversion techniques (2013-2015). He also held visiting scientist positions at the University of Tokyo, as part of the NASA/JAXA precipitation measurement missions (PMM) algorithm development team, in 2012, and at the University of Calgary, in 2015. He received the Ph.D. degree in remote sensing from the University of Bristol, Bristol, UK, in 2012. Dr. Islam was the recipient of the Faculty of Engineering Commendation from the University of Bristol (nominated for a University Prize for his outstanding Ph.D. thesis), in 2012, the JAXA visiting fellowship award, in 2012, the CIRA postdoctoral fellowship award, in 2013, the Calgary visiting fellowship award, in 2015, and the Caltech postdoctoral scholar award, in 2015. He has served as a lead guest editor for a special issue on “Microwave Remote Sensing” for the Physics and Chemistry of the Earth (Elsevier), and currently serving on the editorial board of Atmospheric Measurement Techniques (EGU) and Scientific Reports (Nature). He has published four books and more than 60 peer-reviewed papers in leading international journals. His primary research interests include microwave remote sensing, radiometer calibration, retrieval algorithms, radiative transfer theory, data assimilation, mesoscale modeling, cloud and precipitation system, and artificial intelligence in geosciences. Dr. Hu got his PhD degree from University of Alaska, Fairbanks. Since 1995, Dr. Hu has been a research scientist / senior research scientist at NASA Langley Research Center. Dr. Hu began his career working on radiative transfer and climate modeling in his PhD study. He worked on the ERBE and CERES projects, and then joined the CALIPSO team studying lidar remote sensing. Dr. Hu is currently working on developing innovative remote sensing concepts, such as photon orbital angular momentum measurements and studying sub-diffraction limit telescopes. Dr. Hu’s primary scientific accomplishment includes: theoretical radiative transfer studies for active and passive remote sensing; discovery of the relation between lidar depolarization and multiple scattering for water cloud droplets; development of highly accurate global cloud phase product using CALIPSO observations; high spatial resolution global ocean surface wind speed retrieval technique and data product using CALIPSO lidar measurements; innovative lidar remote sensing techniques, such as using space-based lidar for studying ocean primary productivity and carbon cycle, as well as deriving value added vegetation canopy, snow and sea ice product from CALIPSO; and theoretical and engineering studies of differential absorption radar concept for measurements of ocean/land surface atmospheric pressure; Dr. Hu author/co-authored more than 150 peer-reviewed scientific journal articles with SCI index is 47 on google scholar (https://scholar.google.com/citations?user=YySlI2oAAAAJ&hl=en) and 39 on ResearcherID (http://www.researcherid.com/rid/K-4426-2012). Dr. Alexander A. Kokhanovsky received the M.S. degree in theoretical physics from the Belarussian State University, Minsk, Belarus, in 1983 and the Ph.D. degree in optical physics from the B. I. Stepanov Institute of Physics, National Academy of Sciences of Belarus, Minsk, in 1991. His Ph.D. work was focused on modeling light scattering properties of aerosol media, clouds, and foams. He is the Editor of Springer Series in Light Scattering and Wiley Series in Atmospheric Physics and Remote Sensing. He is the author of the books Light Scattering Media Optics: Problems and Solutions (Springer-Praxis, 1999, 2001, 2004), Polarization Optics of Random Media (Springer-Praxis, 2003), Cloud Optics (Springer, 2006), and Aerosol Optics (Springer-Praxis, 2008). He has published more than 200 papers in the field of environmental optics, radiative transfer, remote sensing, and light scattering. His research is directed toward the solution of various forward and inverse problems of atmospheric optics. Dr. Kokhanovsky is a member of the European Geophysical Union. Jun Wang is a Professor in the University of Iowa, with joint appointments in Department of Chemical and Biochemical Engineering and Iowa Informatics Initiative, and secondary affiliation in Center for Global and Regional Environmental Studies and Department of Civil and Environmental Engineering. Prior to joining the University of Iowa, he worked in University of Nebraska – Lincoln first as Assistant Professor and then Associate Professor. His current research focuses on the integration of satellite remote sensing and chemistry transport model to study air quality, wildfires, aerosol-cloud-radiation interaction, and land-atmospheric interaction. He has authored/co-authored 100+ peer-reviewed articles, and has been a science team member of several NASA satellite missions, focusing on development and improvement of aerosol retrieval algorithms. He is the journal section editor for “New Directions” column in Atmospheric Environment, and a guest editor for Remote Sensing. In 2005, Jun Wang received his Ph.D. degree in Atmospheric Sciences from University of Alabama –Huntsville. In 2005-2007, he was a postdoctoral researcher in Harvard University. More about his research can be found at: http://arroma.uiowa.edu.